For a large part of its history - 18 times out of 61 in fact - the Formula 1 World Championship featured 16 races. With this in mind, and with 16 races already run in 2011, now is the perfect time to compare Sebastian Vettel's title-winning performance against the most dominant from history. 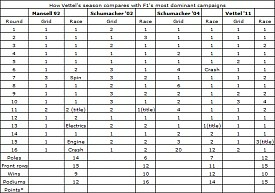 With Vettel's year being constantly compared to the crushing successes of Nigel Mansell in 1992 and Michael Schumacher in 2002 and 2004, it's time to analyse the data and see who comes out on top.